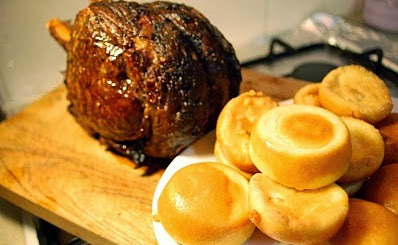 Yorkshire pudding is the classic accompaniment to roast beef. It's like pancake batter cooked in the oven to make the most of the drippings from the roast. For a lighter version use sunflower oil as an alternative. 1. Sift flour and salt in a large bowl. 3. Add the milk a little at a time making sure everything is well mixed together. Set aside for at least an hour. 4. Place a bit of oil in about 12 individual muffin tins. 5. Heat tins in a 220C oven for a few minutes. 6. Pour the batter into the tins about half to three quarters of the way up. 7. Lower the heat to 180C and bake for about 25 minutes. The Beancounter is a husband and a father who's passionate 'bout food and all its facets.